One of the most remarkable results of astro-particle Physics has been the success of the Standard Model, recently culminated in the discovery of the Higgs particle (Ho). However, the Ho is observable only in few channels at the LHC, in the presence of substantial backgrounds. A future phase in much cleaner conditions may also be necessary as it has been the case of the Zo, where its discovery with the hadronic p-pbar collider has been followed by very precise measurements with the e+e-‘s at LEP. The Ho decay channels, the Ho-strahlung, the Ho-fusion diagrams and the double Ho diagrams have all to be carefully studied, requiring √s ≥ 500 GeV in clean conditions and with adequate rates. Sensitivity to new physics at “5 sigma” discoveries may need 1 per-cent to sub 1-per-cent accuracies on rates. Different methods have been described using e+e-‘s, like for instance a LEP-like ring or a Linear Collider however both with huge dimensions. 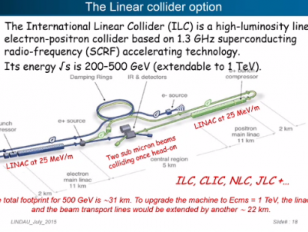 Alternatively, a novel “muon cooling” facility, which has to be demonstrated experimentally, may offer two comprehensive µ+µ-programmes, (1) a Ho factory collider-ring at the s-channel resonance at the Ho mass = √s = 126 GeV and (2) a ring for higher energies. In contrast with the e+e- alternatives, both muon rings (which have radii of only 60 m and 400 m) can easily fit within the CERN site and have a much smaller size and cost, although a superior performance. In addition to the Ho, a neutrino factory (NF) is an important new alternative, in which high-energy cooled muon decays produce intense beams of neutrinos and antineutrinos. In order to demonstrate the feasibility of an adequate muon cooling, an initial Cooling Experiment of a very moderate cost is proposed.